Got a side hustle, aka a second job or, sometimes, that thing you like to do but that doesn't pay the bills? Maybe you refer to it as "a startup" or "an exercise in entrepreneurship." You're putting in a lot of nights and weekends building your product or service and dreaming of the day when you can be your own boss. Perhaps you're working a second part-time job to shore up your household's finances or to fund a specific goal (rapid debt payoff, killer family vacation this summer, down payment for a home of your own). But suppose you're this close to getting that startup in place? What if just three more months' worth of pizza deliveries will slay the last of your consumer debt? Good luck and go for it, then — but please use one or more of the following tips to help ease the stress. Burnout isn't pretty. These aren't one-size-fits-all tactics, mind you. For example, if you're working a second job to stay ahead of the bills you won't want to spent money on takeout or a yard dude. But this list has some tips that will work for just about everybody. It won't kill you (or a partner and/or kids, if you've got 'em) to eat takeout straight from the carton when you're on a serious deadline. Or to develop minimum cleanliness standards versus living in a home as shiny as a 1950s sitcom. You don't have to join a book group, coach a sports team or spend every three-day weekend driving two states over to visit extended family. Cut yourself some slack, already. Work with spouse, partner or roommate to keep home and yard up to those minimum standards; if you have kids, expect them to pitch in. Hint: By age 12 my sisters and I could do just about any cleaning chore, mow a lawn, wash and iron clothes, bake a cake from scratch, weed a garden, and cook a basic dinner for six. Yes, I do believe that today's kids are often overindulged. Teaching them basic life skills will benefit them later, when they have to do such things for themselves. To keep the neighborhood association off your back, pay a local teen to mow the lawn or rake leaves. Hire someone to deep-clean your house once a month and use the "teamwork" approach noted above to keep up with it the rest of the time. If you're a blogger or have created a website to promote your product/service, get a web guru to keep an eye on the tech stuff. Sure, you could do it yourself — but shouldn't you put that brainwidth into your actual blog/product/service? I pay a tech savant $35 a month and was frankly startled by the resulting peace of mind. It's tempting to want to push through fatigue, even if it's midnight and you've been up since 6 a.m. Another hour, you think. I can get so much more done in just 60 minutes. Please see "we actually get stupider," above. 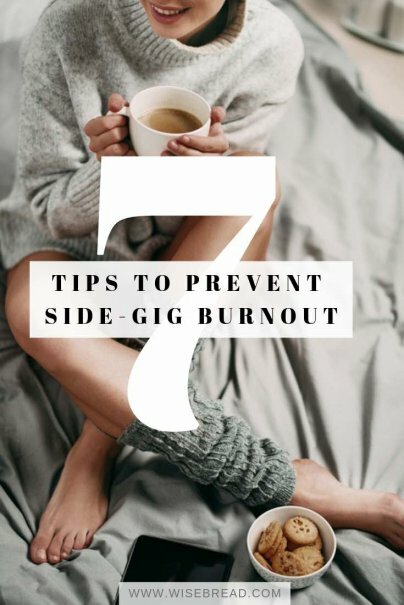 Make sure you get at least seven (preferably eight) hours of sleep per night if you want to make the most of the time you do spend on your side gig. Besides, consistently shorting yourself on sleep means your day job, your relationships and maybe even your health will suffer. Hire a babysitter for two hours once or twice a week and hit your home office/workshop right after dinner. Come back out to read bedtime stories and tuck in your children. If you've got the right sitter, the kids may actually be disappointed when he or she has to go home — and you can get a lot done in two intensely focused hours. During your commute, listen to podcasts or books on tape about your field of interest. Go over your third-grader's spelling words while waiting for the oil to be changed in your car. Run with the dog instead of driving to a gym — that way, both of you get exercised at the same time. Don't do dangerous multitasking, such as checking e-mail while driving, and don't consistently ignore partner and/or kids in favor of a screen. But some things can be combined safely and sanely and without hurting anyone's feelings, such as writing a blog post from the bleachers until your kid's sports practice is over. Just look up every now and then, catch his or her eye, and wave. Sometimes you need to step away from the startup/second job. Keep at least one day and night per week completely, absolutely clear. Use this time to do as little as possible. Play a game of Parcheesi with your kids. Take a long, hot bath. Get into bed an hour early with a good book (or your partner, if you have one). Eat ice cream directly from the carton until you get that pain over your eyes. Do anything but work. Those extra responsibilities will still be there tomorrow. For now, let them go. It's great that you want to start your own business/pay down debt/whatever. But you must allow yourself time to goof off a little, spend time with the people you love, get some rest — and, yes, remain a valued employee at your day job vs. becoming known as the guy or gal who keeps nodding off in staff meetings. Have you ever launched a side hustle? How'd you make it a success without burning out? Editor’s note: This guest post is based on one of the chapters from Write A Blog People Will Read, Donna's brand-new online course. Wise Bread co-founder Will Chen says WABPWR is “required reading for anyone interested in taking their blogging to the next level.” Readers can save 20 percent on the course through April 30, 2015 by purchasing the course through this link. I came across this post this morning just after a colleague of mine at Side Gig #1 (I have two!) told me how terrible and exhausted I look!! I'm guilty of burnout lately, on account of our desire to buy a house, and although I practice a few of these suggestions, I suspect #7 is where my solution lies! There's only so much a body can do... thank you for the reminder! Donna writes the Living With Less column for MSN Money.